DNA-free gene editing can be achieved by using purified Cas9 enzymes with gRNA and transfecting them directly into your cells or protoplasts of interest. GenCrispr Cas9 nuclease is the recombinant Streptococcus pyogenes Cas9 protein purified from E. coli and can be used for genome editing by inducing site-specific double stranded breaks in double stranded DNA. 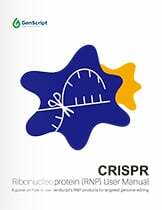 Cas9 protein forms a very stable ribonucleoprotein (RNP) complex with the guide RNA (gRNA) component of the CRISPR/Cas9 system. The RNP complex recognizes the target site by matching gRNA with the genomic DNA sequence and leads to DNA breaks within 3 bases from the NGG PAM (Protospacer Adjacent Motif). Presence of a nuclear localization signal (NLS) fusion with Cas9 enzyme ensures nuclear localization. The GenCrispr Gene editing technology has been licensed-in from the Broad Institute. The activity of all GenCrispr Cas9 nucleases has been validated by in-vitro or in-vivo assays. The bioactivity data for all enzymes is included in the protocol document. To test one of our Cas9 enzymes, please Click Here.